So you find the house of your dreams and you take the plunge, “lets buy it”. You can see concrete tiles and the estate agent says‘ Don’t worry, it has a new roof!’ Why should you be concerned?! 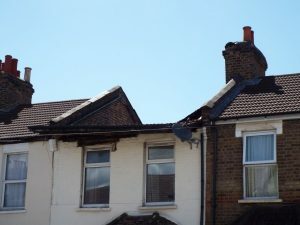 Around 80% of the ‘new roofs’ we inspect in London should have had Building Regulations approvals and did not. This creates a number of problems! First, it’s difficult to sell a property without the correct approvals. Second, the workmanship may not be acceptable if not approved. Thirdly, has the current roof structure been overloaded, concrete tiles are extremely heavy! Lastly, do you want inherit a problem roof? As we know, pre 1930’s roofs in London were usually covered with clay tiles (or slates) which were lighter than concrete. Now the roof has a concrete tile the load has changed and this work would of needed Building Control approvals. This will ensure the roof structure is strong enough to support the concrete tiles. Also that Energy Performance (Part L) criteria have also been met. There was a trend in London in the 70s, 80s, 90s, and still until today of concrete tiles being installed as they are cheap and cheerful and very easy to install. This leads to workman who have been involved in roofing thinking there a roofer and fitting concrete tiles without any consideration for the weight. That’s not to say concrete tiles do not work because in the right circumstances they do, but the roof structure has to be taken in consideration. If the roof has been re-covered with concrete tiles in the last say 2 to 30 years, then very little time will have elapsed. The building’s lifespan is a lot longer than ours! And the faults linked with overloading the property’s roof structure can take many years to develop. The existing timbers (the rafters and purlins) may be too thin to support the new heavier tiles. If they have been replaced, these may also be inadequate. The replacement covering should have been constructed with input from a structural engineer. They would have determined the loadings. They would then have checked that the load bearing walls were suitable for the increased loadings. Why does this matter? First the rafters will bow, causing the load(weight) of the roof to be sent at an angle into the walls. However, the load should be sent vertically straight down to the foundations. This often leads to cracking around the tops of the walls, commonly known as roof spread. This can be seriously expensive to repair. It is not normally the vendor’s fault! Roofing works are very expensive so it is likely that the cheaper quotes were accepted. From a small roofing contractor’s perspective, it does make life easier not to inform Building Control! Awaiting Building Control inspections can delay payments and hold jobs up. And if the work is not inspected, the contractor would not be held liable for infringements at the time. It is likely that this missing compliance “paper trail” is only identified when selling the house. It normally comes as quite a shock to the vendor! Indemnities are often offered by the solicitor but these merely indemnify against enforcement action being taken by Planning or Building Control. They do not deal with the quality of the structure in any way. Nor do they solve future problems when they occur. There’s a very quick trade secret ! 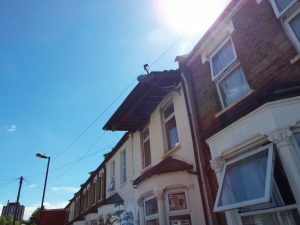 If the roof has been recently recovered and has less than 270mm of loft insulation present, then it would not comply and hence we know has most likely not been inspected. Otherwise, ask the vendor about the Building Control sign-off documentation. If that is not present, make sure you have the roof structure inspected by a competent roofing contractor or an engineer to ensure everything is ok as this won’t happen in a home-buyer’s report! We have above enclosed photos of a worst case scenario of overloading a roof and not complying with the Building Regulations.